Do I have to accept every sponsorship order? Not at all. You have full control over what kind of sponsorship order or offer that you would accept. If the sponsorship order doesn't fit you completely, you can decline the order. Click on the "Decline Order" button. 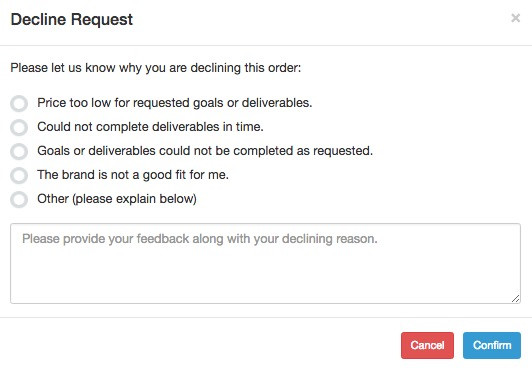 Please pick a reason and tell us why you are declining the order so that our system can learn to find better matches for you. If you think your Package price is listed as too low, be sure to update your prices so that future Sponsors can send the most updated offer to you.